“ID please,” requests the lady bouncer at the Metropolitan Bar. I’m delighted to be ID’d. It’s been years. Okay, decades. 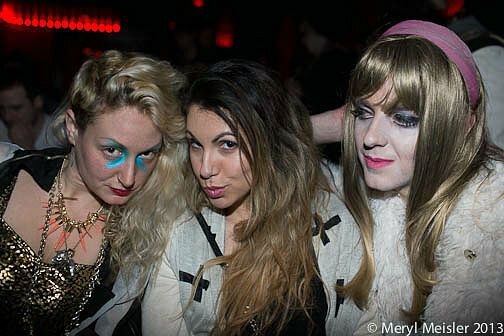 So what dragged me out on a frigid Thursday night to Metropolitan Bar in Williamsburg? Drag Net ! Scott Dennis, a friend I met at BOS12, was performing. It didn’t take much to convince blogger/photographer Catherine Kirkpatrick to come along. 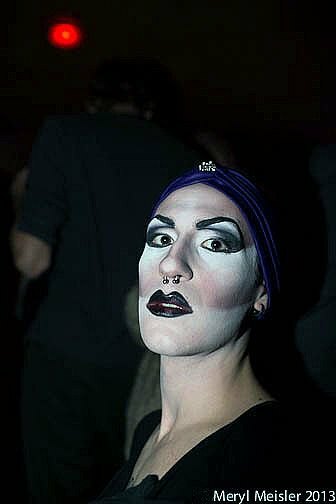 A bit jaded from attending and photographing many of NYC’s wildest clubs and parties in the late '70s and early '80s, I came with few expectations. The party started at 10:30PM and the show at 11PM. There was no admission charge, and ½ price beers. I rallied up to the bar as Nyssa Frank, Kristy Eléna and Mike Garcia arrived. The official Scott Dennis aka Madam Vivian V cheering squad was present and ready to roar. 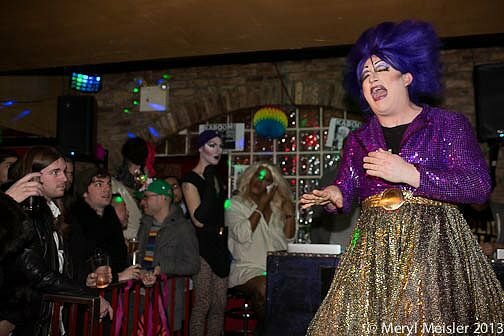 Merrie Cherry gave honored respect to RuPaul and explained DRAGnet was inspired by Bushwig, Bushwick’s First Annual Drag Festival she organized this past September that I sorrowfully missed. 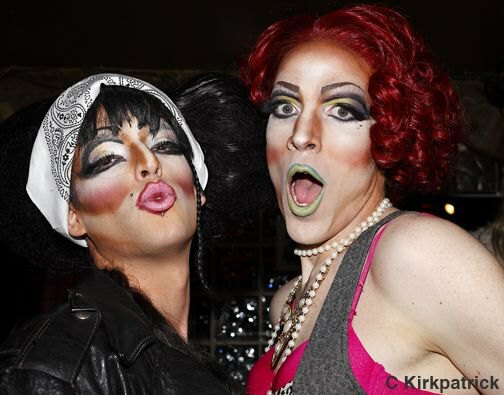 DRAGnet is a competition where Drag Queens are crowned every third Thursday of the month. 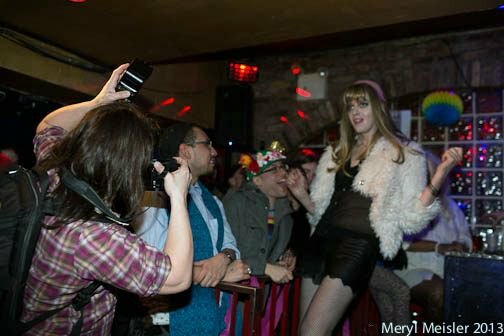 The winner of the evening gets a $50 prize, and competes in the final competition at Bushwig 2013 for the grand prize of $150 and lots of adoration. 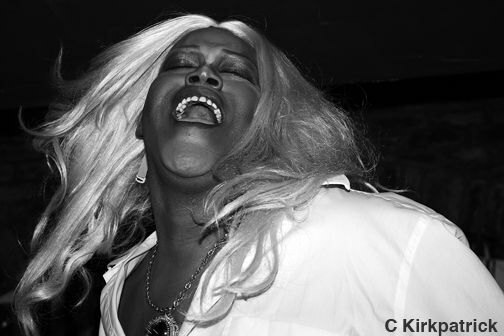 My personal mission was to photograph Madam Vivian V, but the energy and talent on stage were irresistible. Charming Merrie Cherry and BaccHaus were co-hosts. Alotta McGriddles, Scarlett Envy and a woman with jewels on her face were the guest judges. Alotta hinted heavily that any use of food would positively persuade her appetite and vote. The contestants Madame Vivian V, Lady Simon, Gemini, and Tiffany Bloom gave individual performances, lip-synching and dancing to songs of their choice. Jumps, gyrations, techno, teasers, all crowd pleasers - no one act was alike, save their lacking use of food. Then came the lip-off competition, where all four contenders performed simultaneously to a song they were unprepared for. The judges gave their compliments and critiques, with accolades to Vivian V’s classic rendition with a stool that rivaled Sally Bowles in Cabaret. The packed, mixed crowd of about 200 was encouraged to cast their vote by cheering. Merrie Cherry let it be known that she would have the final say after intermission and that was that. Nyssa Frank, Kristy Elena and Madame Vivien V.
Alotta McGriddles did an intermission interlude, pulling off her wig midway. 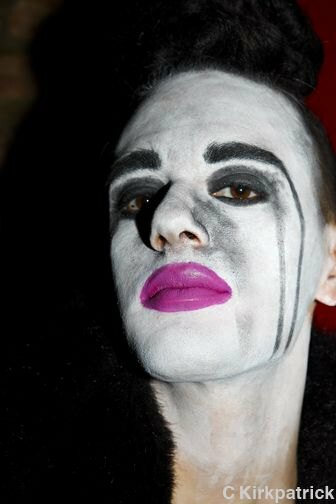 This was no mere ‘Victor/Victoria’ imitation. Alotta transformed into a stud muffin hoodied homeboy with pizzazz and extra long lashes. The clock struck 1AM, Merrie Cherry declared Gemini the reigning Queen. Perhaps Merrie prefers dark coiffures? The winner from last DRAGnet had the same color hair. 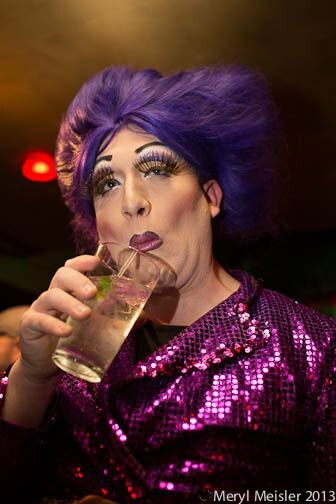 Humming “I’m Every Woman” in my best Chaka Khan intonation, I thanked the bouncer again for asking for my ID and exited.